Sparkle Me Pink: NEW : MARS TWIX Bites + HOT Coupon ! NEW : MARS TWIX Bites + HOT Coupon ! I am practically the leader of chocolate-aholics anonymous OK. Yes, I am trying to lose some weight and I do go to to the gym 5 days a week BUT that is exactly why these Unwrapped Bites are perfect ! Each bag has just the right amount of chocolate-y amazingness in it to satisfy my very persistent sweet tooth. Plus, serious, how adorably cute are these little guys, right ? What is your guilty pleasure ? The same brands you love are now in bite-size pieces. You’re probably wondering why we didn't think of this sooner! Enjoy TWIX® Bites today. These little unwrapped morsels are perfect in any recipe or for snacking on-the-go. Save big on Bites at Walmart by sharing this coupon. Head over here to share and print this COUPON & save on your next bag of Bites. I have never tried those, but you make them sound so good! :) I don't think that will help my diet! Thank you for sharing this coupon with us! AWESOME SAUCE! I printed two coupons. Twix are my favorite candy bars! 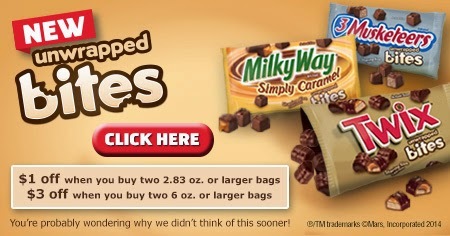 I have tried the Milky way Simply Caramel bites- very good, but I think the flavor would be enhanced if the coating was Dark chocolate instead.